TS30-1300 | Product | MIMAKI SINGAPORE PTE. LTD.
- Featuring only a selected set of functions, the printer is easy to operate. Even first-time users can use it at ease. 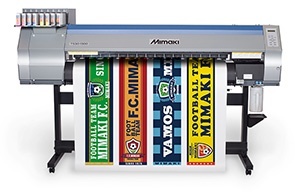 - Mimaki's cost-effective water-based sublimation transfer ink Sb54 is compatible and it offers high ink jetting stability, enabling beautiful printing. - Realizing high-mix, low-volume production or sample creation within your company enables you to present your product to your client quickly. The sublimation transfer technology, which can be used in a range of applications from the creation of customized items to the printing on polyester fabric, broadens the breadth of your business.